"I will deny you before the Emperor if I have to." Millona Umbranox, an Imperial noble, is the Countess of Anvil and wife of Corvus Umbranox, though he has not been seen in years. Millona gets up early every day at 6am, and spends the next two hours wandering around in either the Royal Quarters, the Private Quarters or the Great Hall. She holds court from 8am to 4pm, then returns to her quarters and stays there until 8pm. She then enters the Dining Hall with the rest of the castle's staff for a long four hours before retiring to bed at midnight. On weekends, however, she will break off her routine and enjoy the sunset on the balcony from 5pm until her usual dinner at 8pm, unless it's raining. Her clothes reflect her noble status: a blue silk shirt, blue silks and gold trimmed shoes. She's armed with a silver dagger, and carries a piece of leveled jewelry, a sizable amount of gold, a Castle Anvil key and a Castle Anvil interior key. Upon meeting her for the first time, she will introduce herself: "I am Millona Umbranox, Countess of Anvil. I hope you enjoy your visit. I trust you will give us no cause to regret our hospitality to strangers." If you ask her about Anvil, she will comment: "You can best know Anvil by walking in the streets and speaking with its people. My favorite time is the harbor at sunset, the sun and the sea to the west." She has a very high opinion of High Chancellor Ocato: "Chancellor Ocato has performed heroically. No one else could have held the Empire together during this crisis." 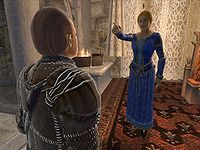 During Allies for Bruma, she will initially refuse your request for help: "I would like to send help to Bruma, but I cannot risk weakening Anvil's defenses with that Oblivion Gate open outside the city." Once you've closed the gate, she will answer your plea: "I've heard that you closed the Oblivion Gate outside Anvil. I honor you for your bravery and service to my city. With Anvil safe for the moment, I will send some of my best soldiers to bolster the Bruma garrison." During Taking Care of Lex, when you provide her with a sealed forged candidate list, she will be rather surprised: "You have the Imperial Watch recommendation for my new guard captain? Normally these missives are handled by my steward, Dairihill. Let me see that. Hmmm. Hieronymus Lex looks like the best choice. I was about to give the position to Dairihill's cousin. I have the orders right there. I'll fill in his name and you can deliver it to Captain Lex. Thank you courier. My steward will tip you." If you catch her outside of her court hours and confront her with it, she will angrily blow you off: "This matter will have to wait. I hold court in the great hall in the morning." The Stranger: "By the power of the Elder Scrolls I name Emer Dareloth as the true thief of Nocturnal's Cowl." Millona: "You're the Gray Fox! I've been betrayed!" The Stranger: "I am the Gray Fox, but you have not been betrayed." The Stranger: "I am also your missing husband, Corvus." Millona: "Corvus! Is it really you? Ten years I've waited for word from you. Why did you hide from me?" The Stranger: "Ten years ago I inherited this cowl from the former guildmaster of the Thieves Guild. I became the new guildmaster, but I also received it's [sic] curse. 'Whoever wears Nocturnal's cowl shall have his name stricken from history.' Once I donned the cowl, no-one in all of Tamriel could recognize me. With the cowl I became the Gray Fox. Without it, I was a stranger, even to you." Millona: "You mean you were unable to return?" The Stranger: "I've stood right next to you, and you didn't even know it. I cried out to you 'Here I am! It's me, Corvus!' but you just looked at me, confused." Millona: "You have broken my heart for a second time. I cannot let the infamous criminal mastermind, the Gray Fox become the Count of Anvil. If you try to announce yourself as Corvus, I will deny you. I will deny you before the Emperor if I have to." The Stranger: "I guessed you would say these terrible things to me. That is why I brought my friend along. From this moment forward, I renounce my life of crime forever. I am passing the Gray Cowl of the Thieves Guild to it's [sic] new guildmaster." After this, if you attempt to speak with her while donning the Gray Cowl of Nocturnal, she angrily repulses you: "Leave my husband and I alone, Gray Fox. Your presence only stirs up evil memories." 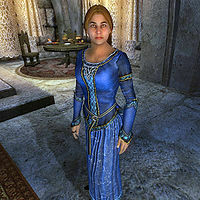 The other County leaders around Cyrodiil will often comment on her missing husband, but don't seem to like him too much: "Millona Umbranox is better off without that irresponsible husband of hers. The most honorable thing he ever did was to disappear and leave her alone." 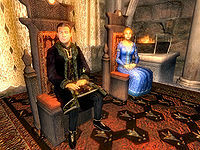 They will however, express their admiration on her leadership of Anvil County: "Millona Umbranox, Arriana Valga, and Narina Carvain seem to rule their counties perfectly well without male assistance." or "I've never heard the Countess mention her husband. I believe it is something of a sore point with Lady Millona." In downtown Anvil, a few citizens will comment on Millona as well. Wilhelm the Worm will say: "Nice, friendly folk in Anvil, even the Countess greets me in the street." Innkeeper Maenlorn will comment: "The Count went missing about ten years ago. No one knows what happened to him. Lady Millona rules County Anvil. Her Ladyship has no intention of remarrying. Liked her first Count well-enough, I guess, and doesn't fancy a replacement." Later on, after the Thieves Guild quest The Ultimate Heist, he will change his story: "The Count went missing about ten years ago... but just recently he reappeared. It's a bit of a mystery, but the Countess seems pleased." 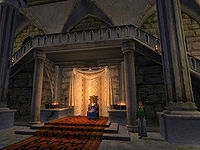 Inside the Chapel of Dibella, resident healer Laralthir will show great envy for the Countess: "I'm just Laralthir. I wish I were the Countess of Anvil, to tell you the truth. That Millona Umbranox, she's got it made... [Sigh.]" Inside the Castle, Dairihill will say: "The Countess deserves all the credit. I do things my way, indeed, but she gives me the authority and support." and Castle Mage Baeralorn will proudly tell you: "Our gracious Countess funds my research." This page was last modified on 7 January 2018, at 12:46.